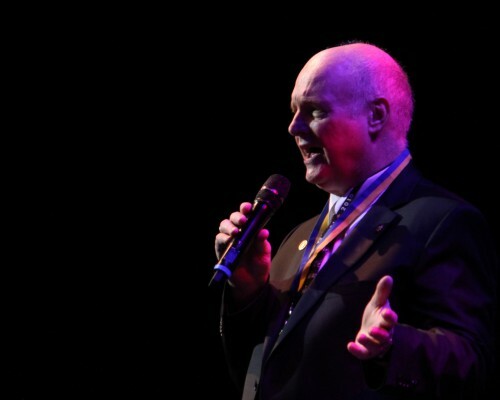 Oakville, Nov 23 – In a surprise announcement during the intermission of a benefit concert at the Oakville Centre for the Performing Arts, senior Rotary officials bestowed a prestigious award on musician and fellow Rotarian Ron Manfield, a Milton resident. Manfield, who was in the middle of a concert to benefit Rotary’s fight against polio, along with the Ron Cary Orchestra and special guest Sharon Smith, was humbled by the award. 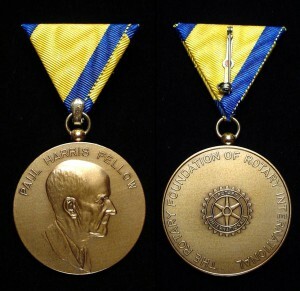 The Paul Harris Fellowship was bestowed on Manfield on stage by Dr. Bob Scott, a past Vice-President of Rotary International, who has served for many years as Rotary’s world-wide ambassador in fundraising activities in support of Rotary’s fight to “End Polio Now.” In his role Dr.Scott has raised millions of dollars from world leaders around the globe in the fight to end the dreaded polio disease. Crooner-pianist Manfield is touring with the Bob Cary Orchestra and Oakville was a final Canadian stop before the band moves on to Chicago and New York dates in 2015. Manfield, the owner of mpcmusic.com, is also producing a feature movie, All for Julie, based upon his song of the same name, which he performed for the Oakville audience, Sunday afternoon. First of all congratulations on your award as a Paul Harris Fellow. As a past recipient of this award twice myself (sapphire) for my activities within the community and as the ‘Best Club of the year’ in our district whilst the President of our club, I know how proud you must be. In regards to your request for donations I already donate annually to the Rotary Foundation for ‘End Polio’ and alike and also to other charitable organisations such as the Heart and Cancer Foundations, the Salvation Army and the Red Cross. As a retiree with a limited budget that only allows me so much per annum over my normal lifestyle expenditures, unfortunately I am unable to support further other worthwhile projects or organisations..
Wishing you well in all your fundraising and dedication to your nominated worthy projects, I trust we will catch up again on one of my future visits to Canada.